2003 Address:- PO Box 599, Doncaster, Victoria, 3108, Australia. Click here to download and view a 3.3 mb mpg (video) file of two mating Sydney Death Adders. This paper first appeared in HERPTILE - JOURNAL OF THE INTERNATIONAL HERPETOLOGICAL SOCIETY IN 1987, What follows is a text only version of the same article (no italics) and without the photos and other material that appeared in the original magazine. Please download the entire article if desired, however if the article is later referred to, please cite Herptile as the original published source. Publication details are that it was published in Volume 12, number 2, pages 56-61. In the period leading up July 1984, the author maintained a breeding group of Death Adders Acanthophis antarcticus. they are oviviparous - but most females fail to have all of their ova fertilised. Most of the above was deduced from notes held by the Author, relating to the previous ten year period and not detailed here. Many facts, however, can be derived from the data provided in table 2. The mating habits and other aspects of this species' biology have been dealt with previously (see, Hoser 1981, 1982, 1983 and 1985). In 1984 the author's four gravid females gave birth to live young In the period 26th January till the 26th February (late summer). Unfertilised "eggs' continued to produce however until the 7th March. In previous years these ova have been produced during the winter months. Typically, the females appear to give birth, during seasonally cold and humid weather, usually when the air pressure is rising. This is true for specimens both in the wild and in captivity (Hoser, unpublished observation). An account of the birth of one anakels young (File no. AAA-29) is given in table 1. Prior to giving birth female Death Adders become unusually restless and, in the case of the author's specimens, tried to excavate the soil in their cages, presumably in an attempt to find a damper location in which to give birth. Interestingly, this pattern of behaviour started up to 60 days prior to parturition. The live young varied in length although litter mates tended to be of similar size. The babies ranged In size downwards from 17.9 cm total body length - the average length was 16.5cm. In this species, at least, the usual theory that larger litters contain smaller babies did not apply; however larger females did tend to produce larger young. Within a single brood the smaller specimens usually, but not always, had reduced change of survival in the period shortly after birth. Data on the young and the mothers, were kept after the births had occurred, and although most of the young snakes were released shortly after their birth, four females were kept for future study. Death Adders have been bred by others besides myself including Peter Mirtschin (1976, 1982, 1985), Joe Bredl, Peter Hudson (1979) of South Australia and Merv Hay (1972) from New South Wales. Their breeding data is similar to my own. All noted that Death Adders mate at all times of the year and only produce young in late Summer and Autumn - and usually only every second year. They also observed the production of unfertilised ova and that they usually give birth in seasonally cold and wet weather. Shine (1980) investigated wild specimens held In museums and his findings concur with mine. My study is the first to investigate the colour genetics of the Death Adder. In view of the results of the 1984 breeding my aim is now to gather further evidence to support my conclusions and gather information relating to tail colour genetics of Death Adders (which is influenced by multiple alleles/genes). Death Adders are threatened In the wild wherever they occur. They obviously can be bred in captivity (and all four females and the males concerned were long term captives); It is hoped that more captive breeding programmes will take place although in the current climate in Australia this seems rather unlikely. On 10th July 1984 the Author's house was broken Into Illegally by corrupt wildlife officials. This break-in was filmed and shown were also on National television. All reptiles, files, computer disks, photographic equipment, slides etc. taken. What wasn't taken was smashed. This was, apparently, a reprisal for the Author's exposition, in previous years, of smuggling rackets and the break-in was the climax of a vendetta maintained against the author. Later court action revealed that the officials had no right to enter and steal the possessions (including snakes) - and the corruption and vendetta were also revealed in much detail. However, despite continuing legal actions by the author to recover stolen goods, to date only a few files and illegally intercepted mail have been recovered. The actions by the Author against these officials continues at the time of writing (March 1987). In the meantime the captive breeding programs and associated research has been terminated. See Smuggled and Smuggled-2 for details of NPWS/NSW Corruption. Birth of young - (AAA-29) Times given are A.M., Eastern Summer Time. ....... time for all young to be born 4hr. 10 min. Table Two. Young born In 1984. AAA/29 - Dead Death Adder Row/Coal and Candle Creek Road, near Terry Hills, about 1 km from McCarr's Creek Rd. Turnoff. AAA/5 - Terry Hills, NSW. AAA/3 - Mt. McCarr, near West Head between McCarr's Creek Road and West Head Road. Hay, M. (1972) Notes on the growth and breeding of Acanthophis antarcticus The Australian Herpetological Society Journal, 4, 4, 14-15. Hoser, R.T. (1981) Unsuitable food item taken by a Death Adder Acanthophis antarcticus Herpetofauna, 13, 1, 30-31. Hoser, R.T. (1982) Frequency of sloughing in captive Morelia, Liasis and Acanthophis (Serpentes). Herptile; Journal of the International Herpetological Society, 7, 3, 20-26. Hoser, R.T. (1983) Mating behaviour of Australian Death Adders, Genus: Acanthophis (Serpentes: Elapidae). Herptile; Journal of the International Herpetological Society, 8, 1, 25-34. Hoser, R.T. (1985) Genetic composition of Death Adders Acanthophis antarcticus in the West Head area. Herptile; Journal of the International Herpetological Society, 10, 3, 96. Hudson, P. (1979) On the breeding and birth of adders In captivity. Herpetofauna, 11, 1, 11-13. Mirtschin, P.J. (1976) Notes on breeding Death Adders In captivity. Herpetofauna, 8, 2, 16-17. Mirtschin, P.J. (1982) Further notes on breeding Death Adders Acanthophis antarcticus in captivity. Herpetofauna 13, 2, 14-17. Mirtschin, P.J. (1985) An overview of captive breeding of Common Death Adders Acanthophis antarcticus (SHAW) and Its role In conservation. In Grigg, G., Shine, R. & Ehman, H. (eds) "Biology of Australasian Frogs and Reptiles". Royal Zoological Society of NSW. p. 505-509. Shine, R. (1980) Ecology of the Australian Death Adder Acanthophis antarcticus (Elapidae): Evidence for convergence with the viperidae.Herpetologica, 36, 4, 281-289. BELOW is a photo of the standard cage housing for Adult Death Adders at the Hoser facility as of 2003. The cage to the left with the fly wire lid is used for a Diamond Python to allow it natural sunlight. Such a lid isn't needed for Death Adders, hence the uncut lid to the right. Also note the ventilation holes on the sides of the cage. These are sufficient. The dimensions of the cage are approximately 59 cm long X 35 cm wide X 23 cm high. Each is of plastic construction with a hardened clay base for a substrate, over which is placed a small number of leaves. At the opposite end to the water bowl the cage sits over a heat mat (no more than 6 inches wide across the rear end of the cage). The rest of the cage is at room temperature. 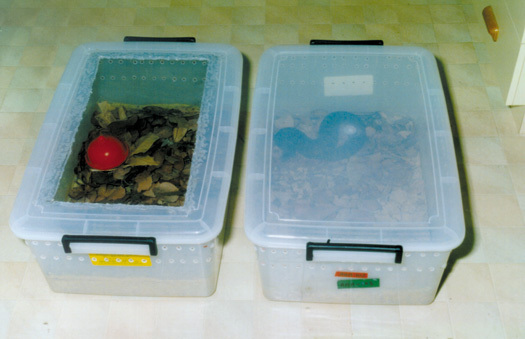 Such caging is adequate for any adult Death Adder (one per cage), but if pressed, more than one can be housed in such a cage, or males and females mixed for short term co-habitation, mating and so on. To see a series of photos of the exact cages used by Hoser for his Death Adders and other important and essential husbandry information. A major 1995 paper on Death Adders. Death Adders (Genus Acanthophis): An overview, including descriptions of five new species and one subspecies An 11,000 word paper in Monitor - Journal of the Victorian Herpetological Society published in April 1998. Death Adders (Genus Acanthophis): An updated overview, including descriptions of three new species and two subspecies. A 2002 paper published in Crocodilian - Journal of the Victorian Association of Amateur Herpetologists. For numerous other papers that deal dominantly or substantially with Death Adders (Acanthophis spp.). Raymond Hoser has been an active herpetologist for about 30 years and published over 120 papers in journals worldwide. He has written nine books including the definitive works "Australian Reptiles and Frogs", "Endangered Animals of Australia" and the controversial best sellers "Smuggled - The Underground Trade in Australia's Wildlife", "Smuggled-2", "Victoria Police Corruption" and "Victoria Police Corruption - 2"
Over one hundred papers about reptiles and frogs. Australian Reptiles and Frogs - The Definitive book on the subject.